Over the past few months, I’ve been working on an exciting, new Ukulele Tricks project! Today, I get to reveal it to you. 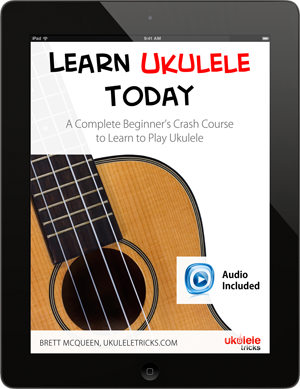 I’m thrilled to announce a new, interactive Ukulele Tricks’ lesson book titled Learn Ukulele Today, now available on the iTunes iBooks Store. 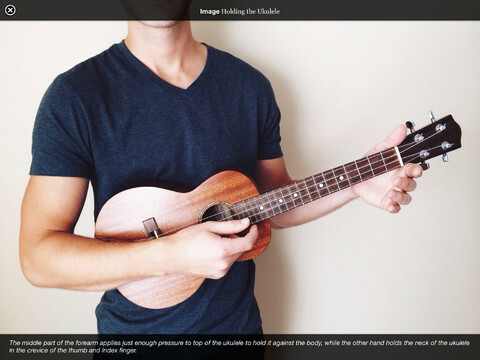 Learn Ukulele Today, packed into an iBook format for the iPad, is one of the most interactive and intuitive, all-in-one lesson resources I’ve ever created to learn to play the ukulele, featuring a beautiful interface, easy-to-follow audio demonstrations, high-resolution images, and detailed ukulele notation, tab and sheet music. 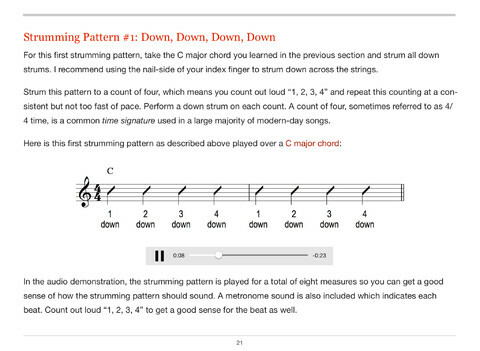 For your benefit, also included are playable audio demonstrations embedded right within the book allowing you to hear exactly how the ukulele is tuned and how the strumming patterns and songs should sound, as seen on the page. While being able to read sheet music is not required to follow along with this book, song notations, detailed images, illustrations and chord diagrams are included, to help you easily learn the concepts and techniques laid out in this book. Get and download a sample of Learn Ukulele Today at the iTunes iBooks Store here. + Where Do I Go From Here? Maybe it’s been your lifelong wish to play an instrument. Maybe you have kids or grandkids you wish to play music with. Maybe you’re a teacher and are interested in using the ukulele in the classroom. Maybe you heard or watched someone play the ukulele and thought to yourself, “I can do that!” Wherever you’re coming from, Learn Ukulele Today, gives you everything you need to start making actual, beautiful-sounding music on the ukulele. 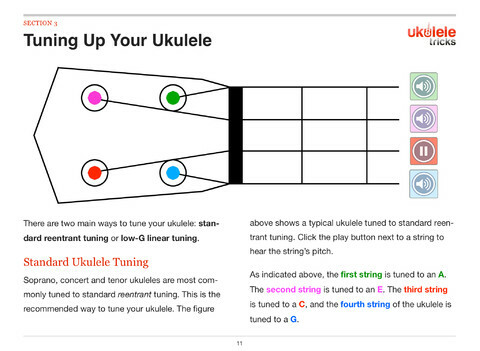 Note: Learn Ukulele Today is designed for the iPad, but it can also be read and accessed using the iBooks program on a Mac computer with OS X Mavericks installed. I just signed up for your Ukulele video lesson series when I noticed your iPad application. I would prefer the iPad interactive book since I imagine I wouldn’t need Internet connection once downloaded and hence it would be more portable. Yet, I don’t want to pay for both. Any suggestions? Hi John, for more in depth instruction to playing the ukulele, I highly recommend the Ukulele Tricks’ video lesson course Ukulele Strumming Tricks. 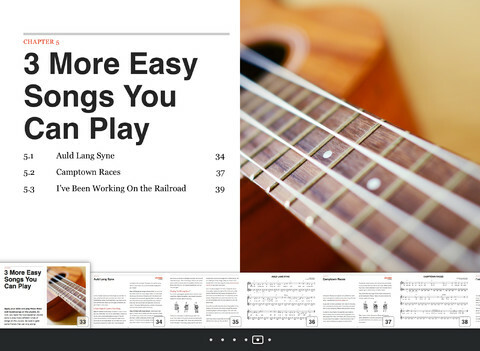 This iPad iBook Learn Ukulele Today won’t be as in depth as Ukulele Strumming Tricks but makes a great supplement for offline reference, especially for the price. Will the ebook be available for android in the future? Hi Ian, if it garners enough interest, I’d love to look at that possibility in the future, but I don’t have any plans yet to bring it over to Android. had my wallet out and…no android version…check the google play store and you’ll see the offerings there are pretty bad…this would be welcomed. I just got a uke and got your ebook to get me started. this might be the stupidest question you’ve ever had but… in your sheet music for twinkle twinkle little star, the written notes don’t seem to correspond with the notes that are written.. what’s going on there? haha just read my post and realised how little sense it made. what I mean is, the letter G is written on top of the page – but the note D is shown on the staff itself. Hi Teresa, hah, not a problem! The letters written above the notes indicate chords. This means that the chord letters will not directly correspond to the notes in the sheet music. 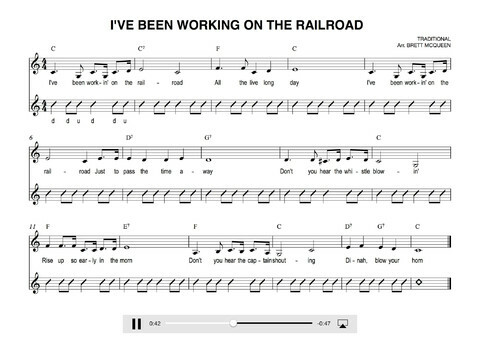 Although, in the case of the G chord, with a little music theory, you know that the notes G-B-D make up a G chord. So this D note in the music staff fits and harmonizes very nicely when you strum a G chord on the ukulele and sing that D note. Hi Mike, at this time, I don’t offer any books or ukulele lesson resources specific to the baritone ukulele. I have a baritone uke and I just play the chord stated in the music and practice the strumming and finger patterns in the lesson. I know my chords but need to practice the strumming and finger patterns. Not the best solution but it works to practice. Is the book available for the Android? I don’t use Apple products. Please don’t forget Android! de numbers on the TABlines are they the numbers from the frets or the numbers from the fretting hand? Hi Plox, in Ukulele Exercises For Dummies, the numbers on the tab lines are the numbers from the frets. I recommend reading Chapter 1 where I explain how to read the ukulele tabs! I would be very interested in this book in an android version as I would like to be able to use it but don’t have an ipad. Hope you will consider doing it soon. Thank you. I definitely would be interested in an Android version as well. Little disappointing it’s no there from the get go. I have had Apple but left it for many reasons. Thanks for what I can access online. Just putting in my vote for an android version… thanks! Android gets my vote too. Not an Apple user.